Just use a large, hot iron, heat the lug, & flow solder into the crimp area. Work quickly, and the plastic won't melt too much. If you use too small an iron you'll melt the plastic long before the solder flows. You could always just remove it too since it's getting covered anyway. no point using a 10 gauge lug really...the stator wires are 14 gauge. The real key seems to be getting a good connection from wire to connector, and then between the connectors. I have a stator hardwire kit that works great if you want to be able to remove them, or you can do as suggested and just bolt them together...be careful to insulate the bolt very well, as you don't want it vibrating and rubbing through. I also prefer solder, although the purist claim vibration can cause the solder joint to fail. so far my solder joints lasted longer than the crimp connections, so I will stick with that. The key to soldering is lots of heat in a concentrated space for the shortest time possible. Naturally too much heat will leave the connector hot for a long time, so don't overdo it. I use a fairly big Weller gun on high, it takes about 10 seconds from start to finish, and the insulation should never melt away or look burned. Dual wall heat shrink is also the best thing ever! Once again, HobbyKing is your friend. Gold plated 150amp connectors, $10 for three sets of five pairs. Oh yeah! Or if they're too big you can go smaller. These things are great because their actual purpose is for connecting to three-phase AC brushless motors - which are basically exactly what our stators are (in reverse). Gold plated 150amp connectors, $10 for a set of five pairs. Oh yeah! Thanks to you and Tightwad for the info/tips. My head's swimming with so many apparent choices among the available methods of connection and protection of the connection. My goal is to relocate the r/r to the underside of the fender eliminator, so that's a complication for the stator, and battery connections/wiring. They were soldered, I guess I'll have to work on a better connection next time. This was the other end of the splice, showing a lot of heat at the crimp. Were those quick disconnects crimped and soldered, or just crimped? Either way, you can see evidence of heat there too. But that's exactly how I bypassed the OEM stator connector on my bike, and now I'm wondering if my quick disconnects are also burnt. I don't know what to say about these connectors, except that maybe you used quick disconnects smaller than 14 gauge? If so, as a general rule of thumb then I don't anything less than 14 gauge would be capable of handling the current flow that each phase of the stator is capable of producing. 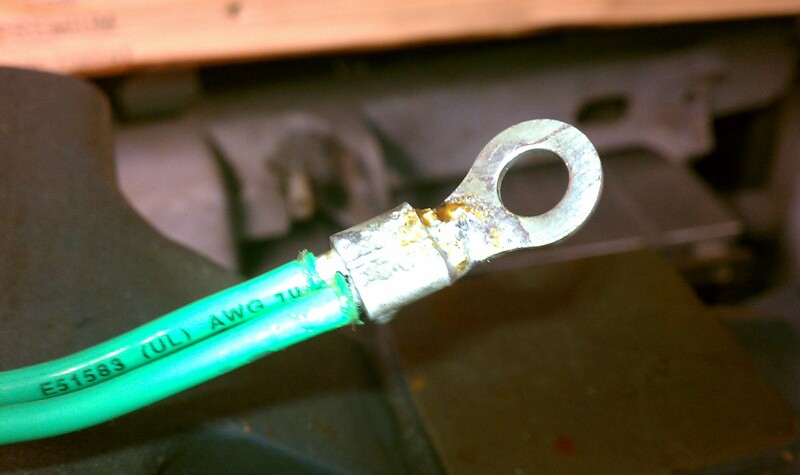 FYI...on a 12 volt system, for a short length of wire 14 gauge is rated at 30 amps, but 18 gauge is only rated at half that. It's always a good idea to make sure the splice did not create any resistance in the wire, especially if the wire handles a lot of current or voltage. What's a good way to make this check? Technically you would want to test a run of wire end-to-end, but that isn't possible with the stator wires because you cant easily get to the ends. But what you can do is test the stator per the service manual. 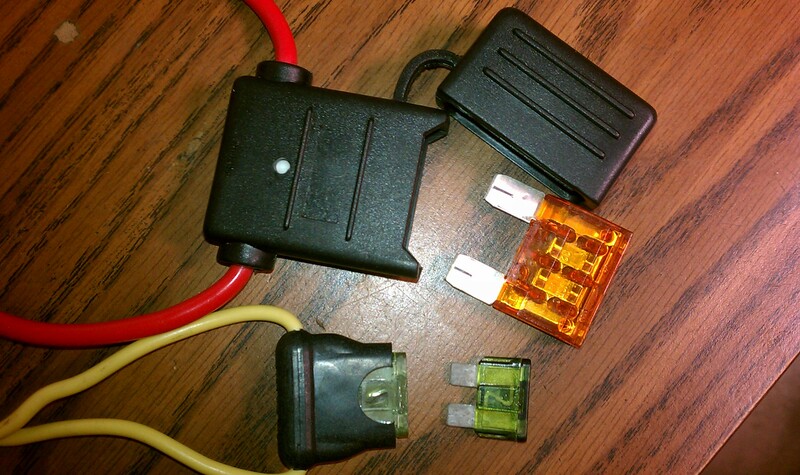 So you'll have to somehow get one of your multimeter leads underneath the insulation of each connector or splice on the side that is nearest to the Rectifier/Regulator, and then connect the other lead to ground. The manual says the resistance of each yellow wire to ground should be between 0.1 - 1.0 ohm (which indicates a good stator), so if you have more than 1 ohm then you probably have an issue with your repair/modification. Perfecto - thanks. I suppose I could penetrate the insulation (beyond the connection) with a pin and use the pin as the upstream test point. Just crimped. Those were definitely 12 or even 10 gauge connectors. I don't know what I could have done wrong, strip the wire, insert, crimp. I'm wondering if it's just an over amperage problem and not resistance through the splice? This was a new splice in Dec. '09. When splicing I always try to get as much wire into the connector as possible, and as long as you have a good mechanical connection at the splice points then they are probably fine. The problem with the stator wires, is that when the engine is at typical operating speed (5K rpm or more) the stator is continuously pumping out about 60 volts AC per phase. Current flow is what's burning wires and melting connectors, so if there is too much amperage flowing through these wires, then you have to look at the R/R since it regulates the current flow from the stator. If you're still burning stator wires and don't have resistance in your repairs, then you might have something else going on with your electrical system. Well, 10 years old battery (orig.) bit the dust so set off in search of a new. The Yuasa is $180 at cyclegear, and i dont even want to know what a stealer charges. My search for a 12S leaves me empty handed, only to find the 12BS which is taller and will not fit under the seat. Sears had the Craftsman 9S which has identical dimensions to the 12S but the A-hr rating is 9 vs 12. So I went with it for $80. Before I add the mix and charge it, and knowing if I use it that cold weather starts will be taxing on this battery, does anyone recommend that I not use this battery in lieu of the 12S? Also, if I do use it, will the added load 'hurt' the RR & charging system? Well, you went from a battery that is barely addequate at 12 amp hour, to one that is defintiely sub par at 9. Cycle gear is not competive on batteries. 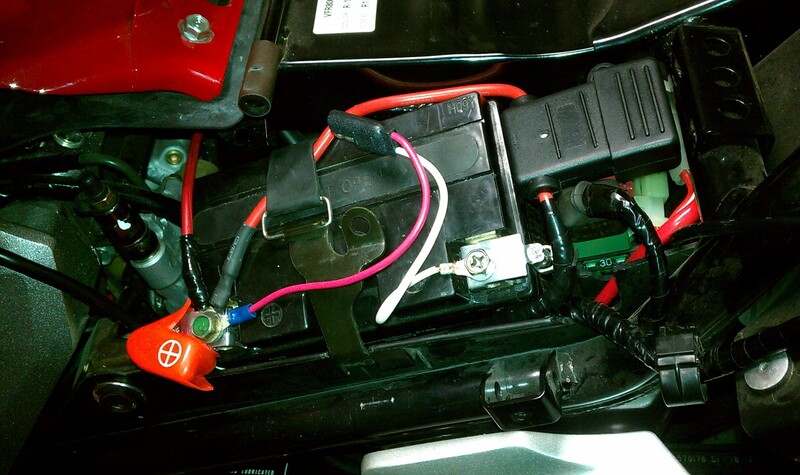 The VFR battery is common to a LOT of other bikes. No good reason you shouldn't be able to find one. I would get a AGM battery myself. Some here are using the lithium variant batteries, but I'm still in wait & see mode on those. Thanks Kaldek - Those Hobby King connectors look like the nuts for the stator hook up! I did the solder route for the splice and now have 13.2V at idle, a solid 14V at 2.5K and 5K rpm. I'm wondering if the bad starter switch I had contributed to the connectors burning? 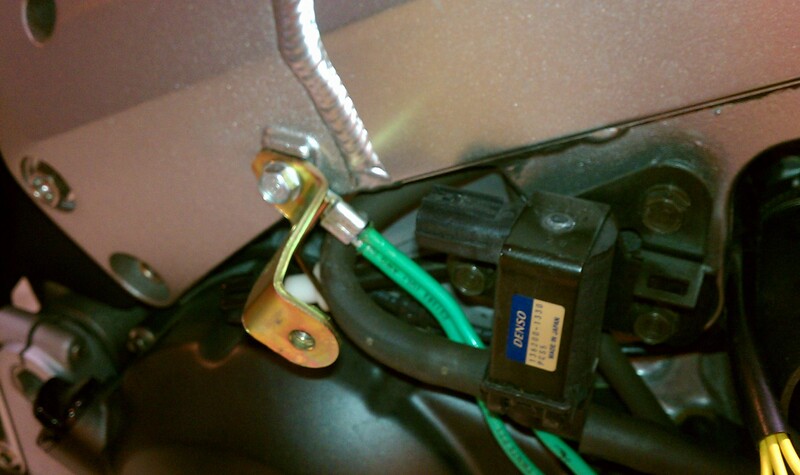 The switch was sticking half way, bike started and ran but headlights were not coming on. Not sure how long this has been going on but I know I had more than a few long (daylight) commutes with the headlights off. ?? 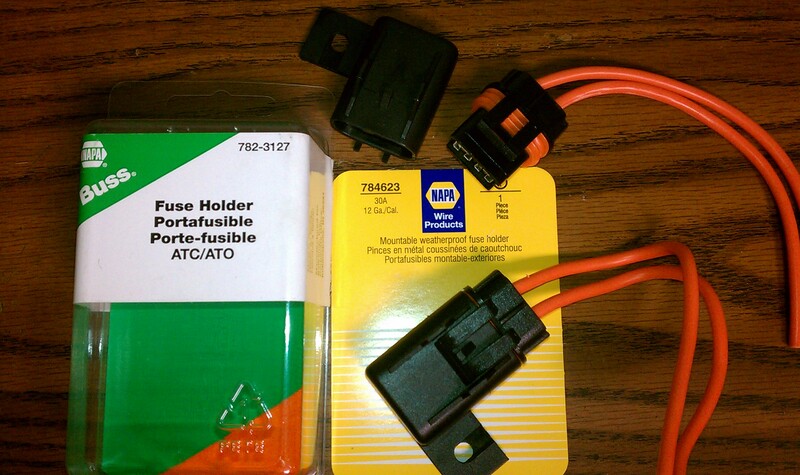 BTW, Walmart sells an inexpensive AGM battery for the VFR, about $60. 2002 VFR 800 VTEC, 3,700 miles, 1 owner till me. I picked it up a month ago. I rode it one week until the bike started cutting out on me! High beams on, day time riding. Just had Honda run the recall, they did the blue connector (front ground issues), and nothing else. I pulled the body off, to check thier work, and look for other problems. I found no signs of heat build up on any connectors. I did not rework the stator wires, as I plan on buying the upgraded Stator/flywheel set soon. I did however die-electric grease all connections and in/out them all several times to clean them off. On the Main 30 A fuse, I went with a "MAXI" type inline, which comes with 8 Ga wire. Much more conducting area for the higher full time current draw, don't ya think? I put a 30A MAXI Fuse in there. I left the original intact, with the fuse pulled, maybe for accy's later. It fit nicely above the starter relay. Yes, I filed the excess solder, down to nice copper. Don't forget to emery cloth or file the frame mount spot clean, as the anodized aluminum is not a good conductor. I also ran 2 x 10 Ga wires from the two + 's on the R/R harness, into two sealed ATO in-line fuses, then back to a soldered connector at the battery post. - Ask to see their electrical parts catalog, lots of great modern stuff in there, most of it made by Buss. - the fuse people. Yes, I need to add some plastic conduit to that power line, I ran out. 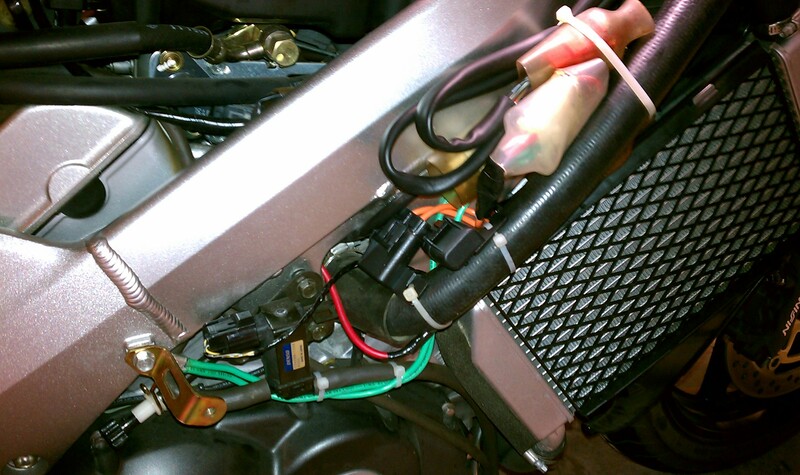 My Next step is another MAXI fuse to branch off the battery, and feed the headlight relays directly. Being a 20A load, I want to rip out the factory wires, connectors, etc and have my own clean power supply up to the repays. This will also let that 30A circuit that powers the rest of the bike, breath a little easier. Please check this guy out. His name is Jack Fleming he sells a R/R which is a MOSFET design instead of diodes. Would this be a good idea to do on a 4th gen? I mean, I can't see how you could go wrong doing the same thing, but would it be a waste of time or beneficial? for the 4th gen the problem is that R/R connector. 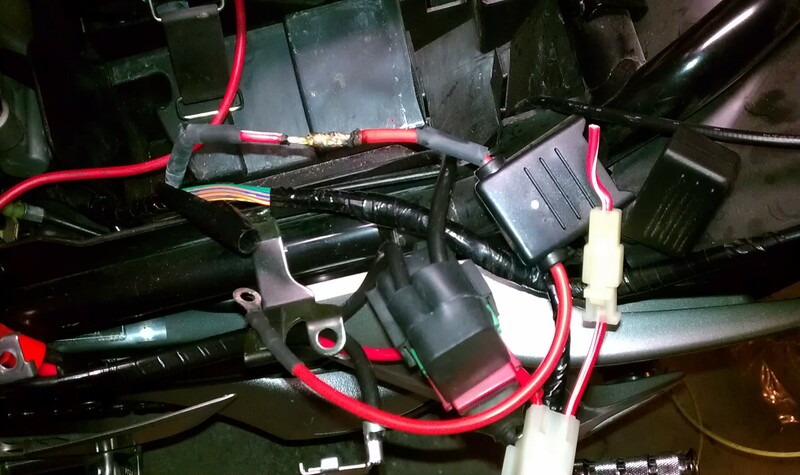 The VFRness I sell is 10 gauge wire to the battery for + and - and a 12 guage wire to the starter relay (red/white wire OEM). Stator wires are also bulked up to 12 gauge down to the stator connector in the front. you sure you want continuity from the yellow wires to ground ? I don't think so. Good info, but with this being kinda technical in nature...pics or a Utube of the original post would have helped immensely.